^ Maybe Rosa pioneered it first and others emulated him after that hence why it's so common now? No idea but I fee like that's the same thing as saying that all OP MCs are a rip off of Gilgamesh (the original one, mind you). What are some other interesting bits of information from the library edition? I haven't had time to read Parts 2 & 3 yet. When I do, I'll post them in their respective threads. Okay, time for a Don Rosa lesson, since people here don't understand what Gene is referencing about him and why that makes me physically ill! Don Rosa is not someone who just added funny background stuff. He was a writer/artist who did Donald Duck and Scrooge McDuck comics for Disney. He wasn't a "true" professional comic creator in that he didn't work on anything else, and he purposefully stuck with the Duck comics despite adverse working conditions. He was a lifelong Disney Ducks fan who used some of his connections as a prominent member of the fandom (back when fanzines and individual letters were the only way to sustain a fandom) to get the chance to write and draw some official comics, and he proved so successful that he eventually won an Eisner Award for his "The Life and Times of Scrooge McDuck" storyline (which I have in hardcover, and it definitely lives up to its reputation as a shining example of how funny kiddie comics can provide great storytelling, characterization, and emotion). So Gene saying that just scripting a funny background is like Rosa painstakingly drawing layers and layers of detail and amusement into his art is the height of pretentiousness, IMO. What makes me physically ill, though, is that Rosa is also defined as the ultimate fanboy. He's not just a fan of the Disney Ducks, he's an obsessive fan of the works of the 'original' Disney Duck writers/artist, Carl Barks, the sole inventor of the Scrooge McDuck character; back when he was a mere fan, Rosa even worked on several timelines of Scrooge McDuck's past back according to all the incidental references in Barks' work ("When I was prospecting during the South African gold rush..." for example) for the sheer pleasure of it. "The Life and Times of Scrooge McDuck" isn't just an origin story for the character, it's a massive 12-issue collection of references and retcons that stands as a painstaking homage to Barks' work in addition to being a story that fully stands alone in its own right. Rosa is so attentive to continuity, he's made up maps, timelines, family trees, and even portfolios of Barks' individual character poses in order to make sure he slavishly adheres to established style and continuity. And he does this simply because he wants to. Because he's a fan, and he has fun doing it. So for Gene, whose work tramples and distorts the original ATLA cartoon to satisfy his own whims as I've detailed at length, to claim to be homaging Ultimate Fan Don Rosa specifically, fills me with disgust and anger. But then, I also had spicy BBQ pork for dinner when I wrote that original post, so that might also have something to do with why it made me physically ill. Interesting titbit though I shall casually gloss over the chronic hate bias you have for Gene. If it cheers you up, I'm not from the US so comics never made it big in here aside from few Disney ones and I read those as a 10 year old so I didn't bother checking who wrote them. I was happy enough I had some. But thanks for the explanation, it was interesting and it really shows that Rosa was dedicated to what he was doing. Though my point was very similar to yours but I guess it just didn't translate well. My point was that drawing funny backgrounds can in no way mean imitating a certain artist. It's more of a wishful thinking. Like saying that any furniture that you can disassemble is imitating Ikea. Or any cake with chocolate is imitating Sacher Torte. Or any anime with mechas is imitating Evangelion. It simply doesn't work that way. It's just some interesting, offhand, titbit commentary from both Gene and Gurihiru which I honestly think that it is not necessary to feel "physically ill" over. I see it as "ABC was voiced/inspired/designed by XYZ". Just a small shout out. If you know about it, cool. If you didn't know about it, it's also cool. I'm curious how a "chronic hate bias" can allow me to like Gene's original works, the FCBD issue with Mai, and even part 1 of The Search, all of which I've made positive public posts about. It's the same way I would feel physically ill if George Lucas claimed that his writing and characterization in the Star Wars prequels was inspired by G.R.R. Martin's writings, and I like the Star Wars prequels (mostly). I just get mad when someone who's really bad at something is strutting around like they're great at it. Actually, Rosa more popular in Europe than in the States, and he's a minor celebrity in Italy. "The Life and Times of Scrooge McDuck" was published in various European nations and even won its Eisner before it was published at all in the US. Disney has a general policy, though, of not crediting the writers and artists who do their comics, so depending on where you are, I can see that being tough knowledge to come by. Yeah, I was backing up your point. Sorry that wasn't clear. Probably, but I've never found a good collection of Barks stuff. Sorry then. I guess I'm so used to having an unpopular opinion that I immediately assume people disagree with me unless stated otherwise. The first two pages ticked me off to no end. 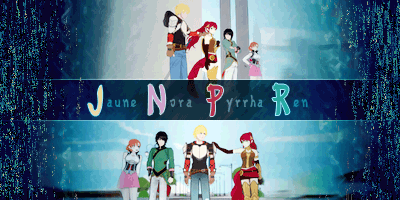 The Yu Dao plotline seems to be wrapped up by off-screen elections that assembled a team of four Unnamed Characters- two red and two green- to rule things. Everyone is happy, a celebratory dinner is had, and the story immediately shifts its focus to Aang and Toph's stupid argument. I know people around here don't like when I say that things sicken, but seriously, given everything that's happening in Afghanistan, in Iraq, in Sudan, in Libya, in Nigeria, in the Democratic Republic of Congo, and all the other countries out there suffering from violence between its own people, how can a plotline like this not disgust people? Elections Are Magic TM in the Avatarverse, apparently, and instantly solve all representation problems. There are no corrupt politicians, no sub-sects that feel disenfranchised, no merchant interests that interfere while the heroes are off heroing, no out-of-touch leaders with the right idea but no idea how to bring their own people along for the ride. The tagline for the series is: "The war is over. Now the hard part begins." The Avatar comics could at least try to capture the same spirit. Also, wow, Aang and Toph's whole conflict really puts a lot of weight on a contrived turn of phrase. Instead of, "That's just the way it's done," Aang could have said something about tradition and its cultural value (which probably would have been more in-character and likely). Instead of, "That's just the way it's done," Lao Bei Fong could have said any number of things about what Proper Ladies or Proper Heirs or Proper Blind People do and why (in his worldview) each one has value. But no, Aang and Lao both said the same awkward thing to Toph despite the situations providing any number of more logical answers. It really makes the resulting conflict tiresome to read because- rather than making it seem like both have good points- it actually colors it more like neither has a good point, and both are pretty shallow people. That's not inappropriate for close friends- certainly, my friends and I have had some shallow conflicts that we weren't really interested in resolving for a little while- but it does make it hard for me to be invested in any of what follows. It makes it feel like it doesn't matter how the conflict gets resolved, because it will most likely just peter out and they'll go out for a cabbage cookie together as a way of making up. There's nothing at stake, no real values being challenged. No wonder this feels like the most low-stakes outing of the Dark Horse run. Maybe it's all "Elections Are Magic" on purpose - just look at what happened in TLOK with the Equalists and Raiko, as written/directed by Bryke. I think a big part of these comics is they are supposed to act as the "Narrative Bridge" between ATLA and TLOK, for better or worse. The theme of "Maybe humans and spirits can learn to get along" was even brought up by Lady Tienhai at comic's end - what happened after Korra kept the portals open, that result being so relatively painless a different type of "Elections Are Magic" in of itself. Mainly, that an old problem can be solved by new thinking with minimal struggle. Having Yu Dao turn out peachy keen fits in with the "Narrative Bridge" role, the aftermath of Zaheer's offing of Earth Queen Hou-Ting the closest they come to a realistic result to conflict in TLOK, and they never really got a chance to show what they thought would happen after the Hundred Years War in the show's original run. The comics, even if written by someone else, are an opportunity for that. Plus, the comics themselves - it's a series more aimed at the kids demographic. While I'd rather any of my own unborn children read something like Maus when they're in their tweens to see how the world works over saccharine alternatives, but only if they want to(how I was raised - being told things unpleasant about human nature early), I don't think the publishers would be too happy if Gene included, say, a bit about persistent hate crimes against firebenders in Yu Dao and elsewhere after the elections. Much less depicting same hate crimes. Who knows - the Gaang we see in TLOK aside from Zuko and Katara are a messy lot or have a mixed legacy, and maybe these interactions are supposed to take that into account. Show how Toph got to be the somehow even more obstinate way she was when Korra met her, how Aang become the eventually flawed father or the type to order his successor "protected" and smothered. If we were talking about Mickey Mouse comics, I'd agree with you, but Avatar already included genocide and a father lighting his kid's face on fire. Likewise, we saw people in The Promise throwing rocks at Sokka when he tried to intervene and calling him a "Snow Savage." Avatar already has hate crimes. It already has corruption. It already has terrible people. I want the comics to reflect the maturity and content of the original cartoon. They could start by making the characters look their ages. I feel Sokka and Katara got the worst treatment in that department. I'd like it as well, but that's an art quirk. Nutha didn't even look as old as she was in the cartoon, either. She was in the cartoon? I guess I overlooked her. That's what I'm saying - to me, from the outset, the comics have been more aimed/marketed at the kids portion of the ATLA audience, hence why we don't see any face-burnings or genocide specials. The original had much broader appeal. One of the most traumatic experiences of his life, and it even had a message attached: if Katara hadn't tried to "protect" Aang, he likely wouldn't have put her and her brother in danger. Honesty is best. And there's nothing even close in the comics - someone calling you a elemental/racial slur hardly counts as in the same league. And I think it's deliberate. Honestly, I see the comics as a way to keep the franchise bankable, a continued money stream, especially given the Colossal failure of the movie. The number of people excluded by older storylines and themes is more than those who would refuse to buy more without those themes present. And I thought Nutha was comics only as well. Naaaaah... The Gaang's "mixed legacy" in TLOK was just an illusion painted by their descendants so that they could blame something for their failures other than themselves. It was played especially straight with Korra: Aang never ordered anyone to close up Korra in that compound, but the Tenzin and Tonraq duo put the blame on him anyway rather than take up responsibility for their own actions. Yeah, but Tenzin is entirely Aang's fault, if just because he didn't ship the kid off to be raised by the Only Good Parent In The World, Zuko. Gyatso was always protective of Aang and did his best so that he could live a normal Air Nomad life for as long as possible. He wanted to make sure that Aang would have an ideal childhood. But here's the thing: how is it that learning about his own culture constitutes a threat to his childhood? Culture is enriching and (more importantly in Aang's case) gives you a sense of belonging, so I don't understand why a wise and loving father figure like Gyatso would think otherwise. Why would he deprive an inherently inquisitive child like Aang of something like that? His actions in The Rift remind me of that of an overprotective and dumb parent, and he never gave me that impression in the show. The Rift, however, needed to have Aang not know the meaning behind Yangchen's Festival so that there could be an element of mystery and suspense to the story, and for this reason Gyatso had to be written out of character. And listen, it might be exaggerated on my part to say that he's out of character when in reality we never knew that much about his character in the first place, but it's precisely because of this that I wanted to learn more about him through these comics. What the writers came up with, though, contradicts what little info we had on him and made him kind of unlikable in my eyes. I'm still not sure why that single panel bugs me so much. I'd go as far as to say that that bit of characterisation is much more bothersome to me than practically everything that happened in The Promise, which trampled all over Aang and Zuko's character arcs. Yeah, it's a blatant contrivance. The history of the festival isn't even all that complex; a kid could easily understand it, which is good, because these comics are written for Easy Readers. 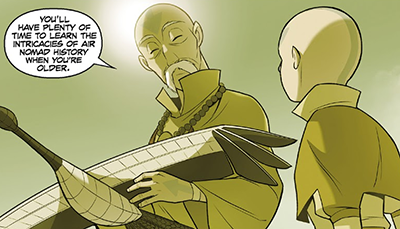 The only reason I could think that Gyatso might try to hide it is because of its connection to an Avatar, not wanting Aang to feel burdened by thoughts of his eventual duties. But if that's the case, then that seems like something that should have gotten more focus and exploration.